We all know power lines carry electricity – some as much as 500,000 volts. 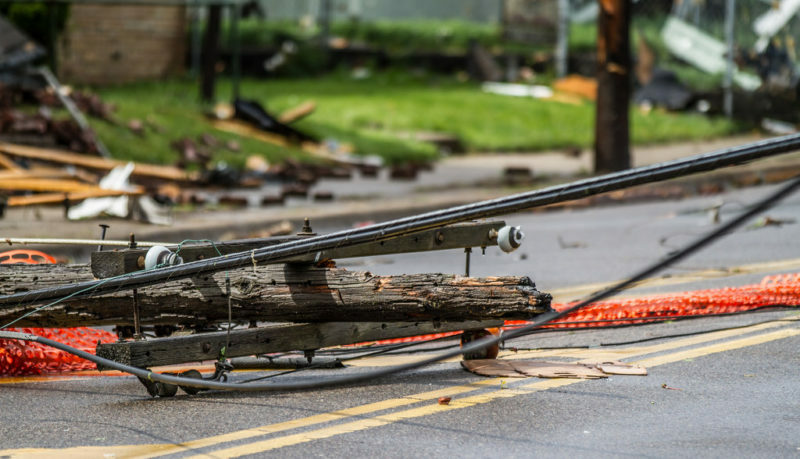 Coming into contact with one can lead to death or severe injury – and that holds true for downed power lines as well. Always assume that any downed power line is energized and follow the simple rule: stay away and stay alive. Severe weather is the most common reason for downed power lines. While all overhead power lines are securely connected to poles, the wrath of Mother Nature can wreak havoc on our system. What should you do if you come across a fallen power line? When moving away from a downed power line, shuffle your feet close together and maintain contact with the ground. Electricity travels through the ground in all directions after the line falls. Voltage decreases the further away you are from the line. If you run or take large steps, you could conduct electricity from one leg at one voltage to another leg at another voltage, which increases the chance of injury or death. Shuffling is the safest method for “retreating” from a downed power line. Immediately call 911 to report the downed line to authorities and first responders. Provide a specific address if possible. Even if a sagging line or broken wire isn’t sparking, humming or “dancing,” it can be “live” with a fatal amount of electricity. Do not attempt to move the wire. Keep all people and pets at least 35 feet away. Do not come into contact with anything the wire is touching. This includes metal objects and even tree limbs. Make sure you are not standing in water. If the wire touches the water, it could electrify it and produce a dangerous amount of electricity. If a wire is crossing a road or driveway, avoid the area and try to keep others from it. Do not allow automobiles to pass or run over it. Do not touch someone being shocked by a downed power line. Do not stand under damaged trees or power lines. They can weaken during a storm and fall minutes, hours or even days later. In the case of a vehicle accident and a downed power line, there are several recommended steps you should take. Drive away if possible, but only do so without running over or coming in contact with any lines. If you come into contact with a downed power line, stay inside your car as the ground around it may be energized. Warn others to stay away. Anyone who touches the ground or equipment around your car could be shocked. Wait until first responders arrive and notify you it is safe before exiting the vehicle. There is an exception to remaining in the vehicle. The Electrical Safety Foundation International (ESFI) recommends car accident victims in imminent danger from a fire or other hazards exit the car by jumping clear without touching the ground and the vehicle at the same time. Try to land with feet together and shuffle away in small steps. Safety is Escambia River Electric Cooperative’s first priority. We value your membership. We value you.